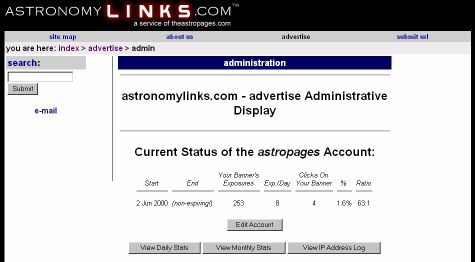 astronomyLINKS - advertising details - astronomy and space directory, links, booksmarks and more. 468x60 banner ad shown on the top of each page. Banner ad in the side-menu section that can be up to 150x100 in size. Text "sponsored by link" in astrowire™. The banner ads are rotated automatically and you will have access to an admin function that will allow you to view up to the minute reports on the number of exposures your banner(s) receive and click-throughs. 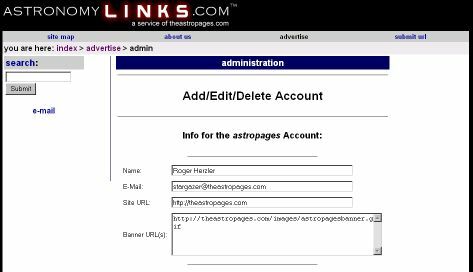 In addition, if an advertiser also qualifies for a link on astronomyLINKS that advertiser automatically receive an "affiliates" link on the top of the page on which their site is listed. A link to our site is not necessary in this case, as it would be for a normal affiliate. For more information on the affiliate program you can go here. Total advertising display comes in around 1300 per day. Typical 468x60 ads display around 200+ times per day. In September, 2002 we had ~10000 visitors. These numbers are bound to continue to go up as our brand name gains more exposure, search engine submissions get indexed and our aggressive advertising campaign continues. Please contact us for up to the minute website stats. As of 5/6/2003 astrowire™ gets about 33000 displays per month. This is up from 16000 in October, 2002. As more subscribers come online this number should increase. This value tracked by comparing website logs for a particular graphic image imbedded in the output and checking the number of times the CGI script that serves it is called. SPECIAL: First time clients get an extra 500 banner impressions or 1 week of astrowire™ advertising NO charge. That's how confident we are that you'll find the value in our services! Banners are typically hosted on your site, although we will host your banner for you if you need this service. If you'd like us to host it simply e-mail your banner to us after you sign-up and we'll take it from there. This is especially recommended if your server has a history of being slow which could result in your banner not being displayed properly. Multiple banners are allowed. They are simply randomly selected for display when a banner from your account is up for viewing. Provacative or "adult" banners are NOT allowed. The banners must be suitable for all viewers. All banners are subject to editorial review and approval. Rich media banners or simple text banners are welcomed provided they meet the total byte size requirements of their respective size. An example would be a search engine form placed into your banner ad pointed to your site. Banners must be 13k or less in total file size. Animations can loop 3 times or less. Animations should only be 7 seconds or shorter in duration before repeating. Banners must be 7k or less in total file size. NOTE: We can create a banner for you! Please for details, let us know what you're looking for in your banner ad and we'll send you an estimate. The astrowire™ service is displayed on other websites. It is up to the discretion of those webmasters where they place the content. It appears that most subscribers make the content readily available to visitors to their websites. We set up a special link in our advertising program to track your click-throughs. Postal Mail: Please to get the payee information and address to send your check or money order to (drawn on US funds). Use PayPal: You can also send us funds electronically via PayPal. Wire Transfers: Wire transfer is acceptable. We can provide the required information. Wire transfer fees are the responsibility of the payee. We want you to be happy and offer a refund with some restrictions. Refunds for ANY ad campaign, regardless of type, are ONLY available during the first 10% of the ad run time/impressions you signed up for, or 20 days/1000 banner ad impressions, whichever comes first. If any of these milestones are reached your ad run will complete as scheduled and is ineligible for a refund of funds already paid. If a refund is due to you it will be refunded within 30 days of your request.